Afterlife can be run in our Partner Venue on request: The Cavendish Arms, 128 Hartington Road, SW8 2HJ, London Afterlife is a portable experience, and can also be run in any venue of your choice. Almost fifty-five years ago, the mysterious death of Susan Jenkins (nee. Miller) gripped the press. In death, she became a figure of mystery and tragedy – a legend that refuses to die in the Afterlife. When her widow, Nelson Jenkins, was later found mysteriously dead with several sealed boxes alongside his body, Susan's mother, Eileen Miller, took control of his estate. It is said she locked away these boxes inside a cursed brown leather bag, either protecting or trapping the late Susan forever. Allegedly cursed to the earth every five years, Susan's soul is rumoured to be trapped inside these artefacts. Many further claim that Susan will speak to anyone who will hear her from the Other Side, telling them she is unable to pass on in peace. In the meantime, the cursed brown bag, sealed away since the death of Eileen, has passed from owner to owner, bringing with it a long history of mysterious fires. Despite never opening the bag, many have claimed to have contacted Susan. Mediums, psychics and even C-List TV celebrities have all claimed to have reached out and spoken to her. Some have even died in mysterious circumstances after these alleged contacts. All of this has given rise to the legend of THE MILLER CURSE. But this time, it will be different. Dr. Skepter is putting together the first professional, scientific and legitimate investigation of The Miller Curse. His Institute is looking for a team to join his quest – a selection of random individuals from all walks of life to support this ground-breaking event. All he needs is a neutral location chosen by you. Is there a curse? Does Susan Miller really reach out from beyond the grave? Will your team prove, once and for all, that there is... an Afterlife? 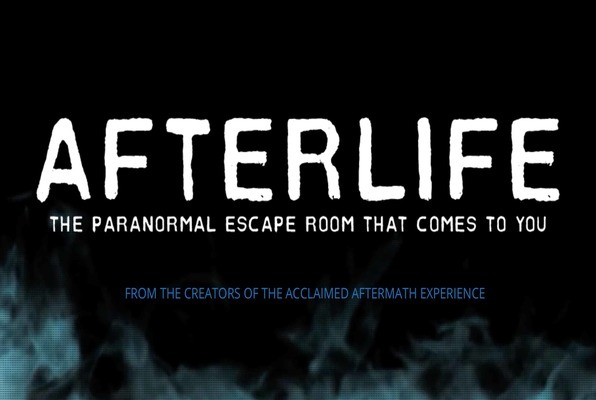 Reviews of escape game "Afterlife: The Paranormal Escape Room Experience"